The world Rugby Seven Series officially known as the HSBC World Rugby Seven Series is an annual event that features national seven teams with the season’s circuit staging 10 tournaments each year and runs from November or December and runs until the end of May. These tournaments are hosted in 10 different countries and across five of the populated continents in the world. The countries that host these tournaments include Hong Kong, Canada, United States, South Africa, Australia, New Zealand, United Arab Emirates, Singapore, England and France. The teams that take part in the tournaments are determined by a point system where points of each team are added at the end of a circuit the lowest placed team is replaced by the winners of the Hong Kong series. The schedule for the men’s and women’s 2019 tournament has been conformed with 11 core women’s Blog about rugby teams and 15 core men’s teams participating in this event and it’s through this event that slots for the Tokyo Olympics in 2020 will be determined which proves that it will be a highly competitive season. A sixth round has been introduced to the women series and it will be hosted by the USA Rugby on 20-21 October 2018 to mark the beginning of the season which will culminate in France on the 31st May-1st June 2019. The men’s series will consist of 10 rounds and will begin on 30th November-1st December 2018 in Dubai and Paris hosting the finale on 1-2 June 2019. The 16 teams that will be competing have also been selected with Japan replacing relegated Russia. The inclusion of rugby sevens in the Olympic has helped increase the number of viewership and fan engagement with the sport becoming popular according to World Rugby Chairman Bill Beaumont. In the 2018 edition South Africa were crowned the men’s winners while Blog about rugby Australia women took the women’s award. After a successful debut in the Olympics at the Rio 2016 games, the Rugby Sevens will make the second appearance Blog about rugby at the Japan Olympics in 2020. Fiji and Australia won the men and women title respectively setting the stage for another entertaining showcase. A total of 12 teams will compete in the men and women events with Japan men and women team qualifying automatically. The next four slots will be taken up by top 4 finishers in the 2019 HSBC world rugby seven series. Africa, North America, Asia, Oceania, Europe and South America are to fill the next 6 slots by hosting regional Olympic qualification tournaments that will run between June to December 2019. The next two highest ranking teams in the regional tournaments will then play each other to determine who fills the last slot available. This event is set to take place at Tokyo Stadium from July 27th to 1st August during the summer Olympics. 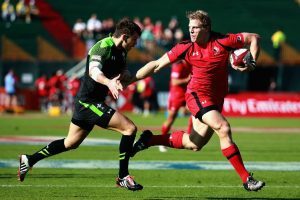 The rugby sevens has seen a tremendous growth in the recent past that has been attributed to more investment in the game and inclusion in the big stage such as the Olympics as a sporting event.